A true surgical emergency – here time is of critical importance. 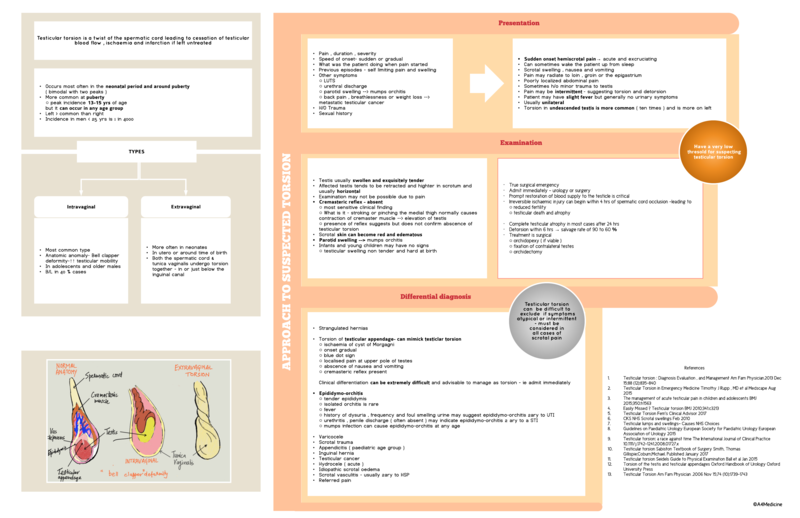 This chart on testicular torsion on A4Medicine describes the types of torsion and with the help of anatomical illustrations, the mechanism can be easy to understand. Presentation of testicular torsion and examination is described in detail. A simple illustration of the cremasteric reflex aids in the assessment. Detorsion within 6 hrs has a salvage rate of 90-100 %. The reader is presented with a differential diagnosis box to r/o other conditions.